↑ 1,0 1,1 L.M.A. (1985). "Europe". u: University of Chicago. Encyclopædia Britannica Macropædia. 18 (Fifteenth izd.). U.S.A.: Encyclopædia Britannica Inc.. pp. 832–835. ISBN 0-85229-423-9. ↑ Ripley, George; Charles Anderson Dana (1883) (Digitized 11 October 2007 by Google Books online). The American Cyclopaedia: A Popular Dictionary of General Knowledge. D. Appleton and company. str. 499. http://books.google.com/?id=GEpMAAAAMAAJ&pg=PA499&dq=Norway,+Denmark,+Germany,+the+Netherlands,+Belgium,+and+France+%22North+Sea%22. pristupljeno 26 December 2008. ↑ Helland-Hansen, Bjørn; Fridtjof Nansen (1909). "IV. 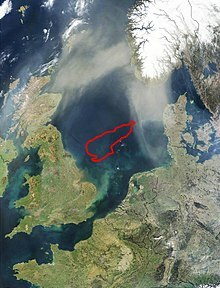 The Basin of the Norwegian Sea.". Report on Norwegian Fishery and Marine-Investigations Vol. 11 No. 2. Geofysisk Institutt. http://web.gfi.uib.no/The%20Norwegian%20Sea/TNS-002.htm. pristupljeno 9 January 2009. ↑ "About the North Sea: Key facts". Safety at Sea project: Norwegian Coastal Administration. 2008. http://www.safetyatsea.se/index.php?section=northsea. pristupljeno 2 November 2008. ↑ Ray, Alan; G. Carleton; Jerry McCormick-Ray (2004) (Digitized by Google Books online). Coastal-marine Conservation: Science and Policy (illustrated izd.). Blackwell Publishing. str. 262. ISBN 0-632-05537-5. http://books.google.com/?id=E7xLaYVGEF4C&pg=PA262&dq=%22North+Sea%22+watershed. pristupljeno 21 January 2009. ↑ Leibniz-Institut für Ostseeforschung Warnemünde: Gehört das Kattegatt noch zur Ostsee? ↑ "Chapter 5: North Sea" (PDF). Environmental Guidebook on the Enclosed Coastal Seas of the World. International Center for the Environmental Management of Enclosed Coastal Seas. 2003. http://www.emecs.or.jp/guidebook/eng/pdf/05north.pdf. pristupljeno 24 November 2008. "North Sea". Country Analysis Briefs. Energy Information Administration (EIA). January 2007. http://www.auburn.edu/~johnspm/gloss/absolute_advantage. pristupljeno 23 January 2008. "North Sea Facts". Royal Belgian Institute of Natural Sciences. Management Unit of North Sea Mathematical Models. http://www.mumm.ac.be/EN/NorthSea/facts.php. pristupljeno 15 February 2009. Waddington, Clive; Kristian Pedersen (2007). Mesolithic studies in the North Sea Basin and beyond: proceedings of a conference held at Newcastle in 2003. Oxford: Oxbow Books. ISBN 1-84217-224-7. Jürgen Ehlers Die Nordsee. Vom Wattenmeer zum Nordatlantik. Primus Verlag, Darmstadt 2008, ISBN 978-3-89678-638-8. Norbert Fischer, Susan Müller-Wusterwitz und Brigitta Schmidt-Lauber (Hrsg. ): Inszenierungen der Küste. Reimer, Berlin 2007, ISBN 978-3-496-02800-0. Horst Güntheroth: Die Nordsee – Portrait eines bedrohten Meeres. Gruner und Jahr, Hamburg 1986, ISBN 3-570-07168-5. Richard Pott: Die Nordsee - eine Natur- und Kulturgeschichte. Beck, München 2003, ISBN 978-3-406-51030-4. Ova stranica je zadnji put izmijenjena 00:12, 4 juli 2015.